A Solid Program To Get You Solid For Hockey! For hockey performance, it is most important to build strength and flexibility in the 'speed center.' 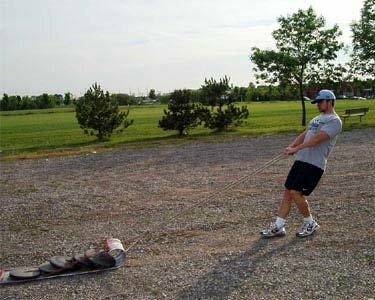 Here we will share a training program that will surely get you back in shape for Hockey. Check it out! As they watch the Stanley Cup finals, this is the time of year where many young hockey players begin to dream of next season. In North America, most players are on the ice year round, with only small breaks between winter hockey and summer hockey. And even if a player does not commit to a summer team, almost all players are back on the ice by mid-August. With these timelines in mind, CB ATHLETICS has developed an 8-week preparatory program for hockey. Strength and Conditioning Coach Randy Lee of the Ottawa Senators adds, "Train for athleticism and a strong core. We use lots of single leg exercises, even doing dumbbell rows on a single leg. We also use the stability ball for some exercises. We do this all year round and really see the benefits, even during the season. "These exercises even benefit the guys that are already strong in traditional exercises. 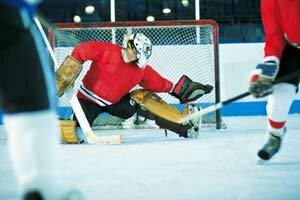 Single-leg exercises make players much more stable on the ice and help the players from getting knocked off the puck." When it comes to strength training, experienced coaches have many valuable tips. Charles Poliquin recommends the use of the step-up over the use of the squat in development of skating power.1 While it is great for all of these muscles to be strong, it is also important for the player to be able to move explosively. Coach Mike Gough offers an intensive and comprehensive hockey (and football!) preparation program each summer in Ottawa, Ontario. When asked to summarize his training philosophy, Mike said, "Hockey demands high levels of speed, power, agility and anaerobic fitness. "A comprehensive strength-training program is the foundation of a hockey specific conditioning program. But even more important are the Speed, Agility, Plyometric and Anaerobic training which is what makes the difference with elevating on-ice performance. I feel that this type of training takes my athletes to the next level." Increases in speed, foot speed, power and lactic acid tolerance are the keys to elevating an athlete's hockey performance. I suggest 3 intense speed-agility-plyometric sessions per week complemented with three to four strength training sessions per week. As the season draws near, I usually lighten up on the volume (reducing it to only 2 strength sessions) as the athletes are conditioning on-ice as well." You can learn more about Coach Gough's program and experience at optperformance.com and cbathletics.com. Many players may ask why the emphasis is not on bench presses and leg extensions? Coach Gough explains the value of more important explosive training, "Train at high speeds. Do every speed, agility and plyometric drill as fast and as explosive as possible. Constantly change exercises or drills to challenge the body, increase the difficulty, and add stability and balance into drills. Remember we must not only train the muscles but also the brain!" It is very different to prescribe a "one size fits all" program over the Internet. As a player, it is your best bet to become informed and to identify your priorities over the off-season. What is holding you back from being the best player you can be? If it is on-ice quickness, then focus on developing explosiveness outside of the weight room. If you simply need to gain muscle, then you may want to include up to 4 weight workouts per week, plus a major overhaul on the nutrition program to make sure you are eating properly. The MASSIVE ACTION program has all the details for that. The CB ATHLETICS hockey program and MASSIVE ACTION manual are not restricted to hockey players, as both will benefit all athletes in power sports. The speed-agility-conditioning sessions are also excellent for all athletes. You don't need to spend 5 days a week in the gym following a bodybuilding program. The CB ATHLETICS program recommends strength training only 2 days per week for most athletes, with the option of up to 4 workouts per week. Focus on leg strength. Pro hockey players have strong and massive legs that enable fast skating, puck control, balance and injury prevention. Leg exercises should be modified to address the groin. Sport-specific training decreases early season injuries. Some exercises should be modified so that they are performed in a single-leg stance to help improve balance, as recommended by Randy Lee. No direct lat work is necessary, just upper back work. Emphasize rowing movements. Abdominal work can be done for strength and explosiveness (using medicine ball drills—wait for an upcoming newsletter that will describe a wide variety of drills). Journal of Hockey Conditioning and Player Development. 2(2): 6-9, 1997. With the belief that many players will be back on the ice as early as mid-August or early September, the following 8-week program arrives just in time to help them develop the strength and speed necessary to make next season their best ever. The 8-week program will follow a 7-day training schedule, outlined below. However, the program will change quite dramatically over time as strength is developed and explosiveness and agility become the training goal. 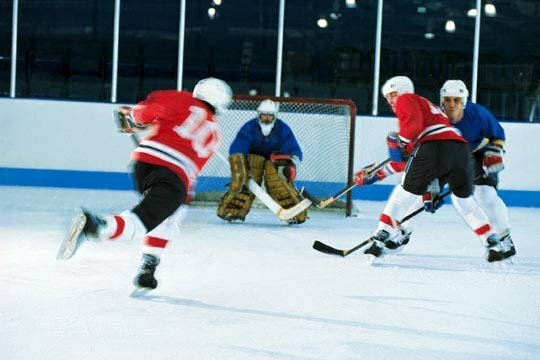 According to Dr. Duncan MacDougall, professor emeritus of McMaster University, hockey players need to begin training in the pre-season for oxygen extraction and muscle strength. As the pre-season approaches, interval training should become more intense and muscle power should be the focus of training. Preferably, more than 8 weeks is scheduled for training, but unfortunately, many players take a long rest between their last playoff game and their first off-season workout. Whatever your current fitness, don't get caught up in the trap thinking more is better. According to neuromuscular physiology expert Dr. Digby Sale, "It should be noted that many speed and power athletes are probably doing too much, especially low intensity, high volume activity that may be used simply to kill time in a training session." Don't workout simply for the sake of training, workout with a plan! Start smart. If you haven't trained in 2 weeks, you are going to be sore if you jump right back into a full workout. If this is the case for you, perform half the volume listed in your first week. CB ATHLETICS also has valuable advanced recovery tips for all athletes in the archives thanks to Strength and Conditioning Coach Dr. Jonathon Fowles, Ph.D.
Dr. Fowles believes that athletes that don't follow the advanced recovery tips "end up with dead legs in a week. This is one area of research that I am using to tailor into my advanced training area, to balance advanced training with advanced recovery." Expect more exciting news on advanced recovery from Dr. Fowles and his lab at Acadia University in the future. Follow the workout guideline found in ISSUE #74. Spend extra time in the warm-up, making sure to go through the circuit 3 times. Perform only 1 set of each plyometric drill in week 1 and add one set each week. Pick 2 agility drills and do only 2-3 reps in week 1, adding a repetition each week. Next, grab your medicine ball and do 2-3 sets of lying abdominal tosses and standing rotational tosses. Finally, finish your workout with three sprint intervals of 30 seconds. Follow up with the advanced recovery techniques. Click Here For A Printable Log Of Week 1-3: Day 2 Upper Body Strength Training. The intervals on this day will be longer than on day 1. For a complete description, check out the "Sport-specific" interval newsletter. Each interval should last 2-3 minutes and you should reach your maximum heart rate by the end of the interval. Each rest interval should be of equal length. Begin with 3 intervals in week 1, and add 1 interval per week. Follow up with advanced recovery techniques. Perform a similar routine to day 1. However, choose different drills for plyometrics, agility, and medicine ball work. There are no intervals on this day. Click Here For A Printable Log Of Week 1-3: Day 5 Lower Body Strength Training. Perform the workout as in day 1, but finish your workout with 5 intervals of 30 seconds. Follow-up with advanced recovery techniques. Week 4-6: Training To Meet Your Individual Needs! Researchers have looked at the relationship between different jumps and skating performance. The static squat jump had the greatest correlation to the near blue line time, suggesting that the squat jump provides a great estimate of starting strength. Chances are that if you improve your squat strength, you will also improve your skating start. Depth jump performance had the greatest association with fast skating to the far blue line. This indicates higher intensity repeated jumps (i.e. sets of 6 squat jumps) may be more effective in helping skaters become faster over longer distances because the athlete will become better at using stored energy from the previous stride. You can see why all types of jump training are recommended for a successful overall program. For strength workouts, athletes must choose their sets and reps to meet their goals. Players looking to put on mass will benefit from more volume (3-4 sets per exercise and 6-10 reps per set). They must also make sure to consume additional calories. In contrast, athletes that simply want to increase maximal strength can use heavier weights and fewer reps per set (2-5 sets of 2-5 reps per exercise). Adjust your workout to emphasize the jumps that will improve your performance the most. Choose 2-3 jumping drills and perform 3-5 sets of each. Once you notice your performance and technique dropping, move on to the next drill. If agility is your weakness, place a greater emphasis on performing several different agility drills. Make sure to move with a bend in your knees and your head up, just as you will on the ice. Mike Gough uses the speed ladder to really help his guys with agility, "I feel that the Speed Ladder has a great transfer ability to on-ice movements. "I think that it is especially great for defensemen doing patterns backward keeping their head up, just like they are challenged by a forward on-ice. Also they usually have slow feet so it's great." For medicine ball work, there are numerous exercises you can choose from. If you need to concentrate on explosiveness, perform overhead throws with the ball, releasing it at the top of the movement. You can also carry the medicine ball through your agility drills to increase the difficulty. Finish off with a couple of medicine ball-based ab exercises. How is your conditioning? If you just can't make it through a double-shift, keep pushing on the intervals. Add more intervals or increase the intensity and decrease the rest between intervals. You will definitely need to follow up with the advanced recovery techniques after these workouts. Click Here For A Printable Log Of Week 4-6: Day 2 Upper Body Strength Training. Click Here For A Printable Log Of Week 4-6: Day 2 Upper Body Strength Training For Mass Gain. Perform up to 6 sets of 2-minute intervals. Click Here For A Printable Log Of Week 4-6: Day 5 Lower Body Strength Training. Click Here For A Printable Log Of Week 4-6: Day 5 Lower Body Strength Training For Mass Gain. In this workout, perform the warm-up, jumps, agilities and medicine ball work as you normally would. However, in place of the sprint intervals, you can try an alternative form of conditioning called sled pulling. You will need a 100-200 foot dragging space, a sled (toboggan, weighted tire, etc. ), and some weights that you can throw on the sled. 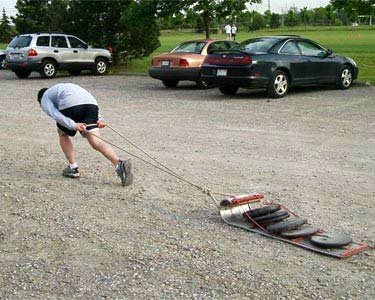 Drag the sled for up to 6 intervals of 200 feet. Train with a partner so you rest while they pull. You can walk forward, backward and laterally. All of these movements will condition your legs in a manner you have not experienced before. Alternatively, you may use wheelbarrow walks (push a loaded wheelbarrow). Also, you have no worries about looking a little out of place. After all, you'll be dragging a sled in the middle of summer. Does it work? Non-elite player Brad Pilon says it has helped him play the best hockey of his life. "I attribute it to the sled pulling, med balls and plyos." Follow up with advanced recovery techniques and post-workout supplementation. Day 7: Active Rest—Well Deserved! Injuries occur when an athlete is not prepared for the specific task at hand. Groin-specific agilities and conditioning are important. Train to improve your weaknesses with the drills that you have found worked best in the previous weeks. Click Here For A Printable Log Of Week 7-8: Day 2 Upper Body Strength Training. Perform up to 6 sets of 30-second intervals. Click Here For A Printable Log Of Week 7-8: Day 5 Lower Body Strength Training. Perform up to 6 sets of 45-second intervals with only 45 seconds of rest between work intervals. Hit the ice in your best condition yet!